In front of us there is only the sea! Managed by the Brighi family for over 3 generations, the Augustus Hotel in Misano Adriatico was completely renovated in 2013. It is a short distance from the beach and offers ample secure parking, free WI-FI, services for families. It is equipped for cyclists. The hotel is located in Misano Brazil, on the border between Misano and Riccione, right in front of the beach: to reach it, simply cross the promenade. Misano World Circuit Marco Simoncelli is a 10-minute drive away. All rooms are soundproofed and recently renovated. Connecting rooms are available. COMFORT: intimate rooms, with French balcony or balcony, but without sea view, can accommodate up to 4 people. They are equipped with electric blinds or curtains, air conditioning, WI-FI, LED TV 22, 26 or 32 ", electronic combination safe, entry with key card, direct telephone, modern bathroom with hairdryer and shower, set of courtesy, daily linen change and minifridge on request. RELAXATION IDRO: romantic room for 2 people, with balcony on the sea side, bathroom with hydro jet shower and chromotherapy. A cot can be added for children. SEA RELAX: large, with sea side balcony and beach view. They can accommodate families up to 4 people. In addition to the services listed, they allow the addition of safety rails, bath tubs and cribs. PANORAMIC: they have all the services in the other rooms but with a suggestive balcony facing the sea. Dehor and playground for children, sun terrace, free use of bicycles with child seats, american bar, lounge with satellite TV, reading room, lift of the latest generation, free shuttle service to airport and station, secretarial services, Sunday aperitif in outdoor dehor, weekly Romagna dinner, dancing evenings. The Territory Manager service is available at the hotel: an expert from the Romagna area and from the Marche region will be present to provide all the information needed to organize excursions throughout the territory. It is equipped for cyclists (assistance for route planning, bicycle parking and bed & breakfast formula). PARKING: free and guarded 24 hours a day for all guests, covered parking for bikes and motorcycles. WI-FI: fiber connection throughout the structure. AIR CONDITIONING: present in the common areas, available in a self-regulating room with home automation. CONVENTIONS: beach, amusement parks, spas, shuttle service on request. SERVICES FOR DISABLED: entrance on the ground floor with a sloped ramp, standard elevator, shower with wheelchair access in the bathroom. BREAKFAST: a sweet and savory buffet with homemade desserts, muffins and croissants, cakes, yogurt, fruit, nutella and biscuits, meats and cheeses. LUNCH AND DINNER: 3-choice menu with dishes based on meat and fish, buffet of cooked vegetables, raw, appetizers, pizzas, focaccias and salads. Pasta and desserts are homemade, water is included with meals. OTHER: Sunday in the outdoor area an aperitif is offered and once a week the Romagna dinner is held to taste the typical recipes. In hotel: indoor and outdoor playground area, strollers, bicycles with child seats, small pediatric pharmacy. On request: trusted pediatrician. In the room: camping beds, cribs, bottle warmers, anti-fall rails and minifridge to store milk and yogurt. At meals: flexible hours, baby menu, ingredients for baby food (vegetable and meat broths, pastries, smoothies, etc ...), colored placemats, plastic cutlery, seats and interlocking chairs. On the beach: playground, entertainment, baby / mini club and changing cubicle. 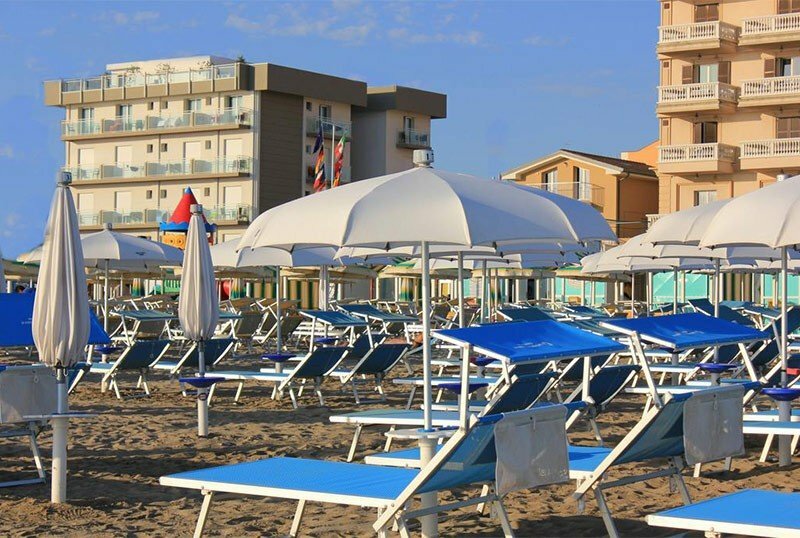 The hotel has an agreement with the Bagnio n. 1 and 2 of Riccione and with n. 2 of Misano Adriatico. At guests' disposal services for all tastes: playground, mini club, sports fields, pedal boat rental. Prices are per person per day for stays of minimum 7 days. Weekends, Pink Night and MotoGP are excluded. TOURIST TAX: excluded. € 0.80 per person per day for a maximum of 7 consecutive nights, starting from 13 years of age. ALL INCLUSIVE: Full board + Bottled mineral water + 1 umbrella and 2 sunbeds on the beach in front of the hotel (to be paid directly to the lifeguard at a discounted price). - Single room: from + € 5.00 to + € 10.00 per day (depending on the period). - Full board begins with lunch on the day of arrival and ends with breakfast on the day of departure (whatever the meal on the day of arrival), any meals not consumed on arrival or during the stay are not recoverable on the day of departure . - Reservations must be accompanied by a deposit of € 200.00 by bank transfer with the coordinates that will be provided in the confirmation email. - Cancellation within 30 days prior to arrival, refund of deposit with deduction only the cost of the return transfer. - Cancellation from 29 to 10 days prior to arrival, deposit recovery during the summer season based on availability of hotel rooms. - Cancellation from 10 days before the date of arrival, the full amount of the deposit is withheld without the possibility of reimbursement to cover the "damage" of the non-arrival. - For an early stay interruption, the maximum amount of three nights will be charged. And the bridge of April 25th? Everyone at the sea in Misano! All Inclusive from 51.00 euros. - 1 umbrella and two beds at the beach in front of us .. and in a second you're at the beach! -1 umbrella and two beds at the beach in front of us .. and in a second you're at the beach! Stay with your children, one under 6 is FREE! Full board formula, starting from € 45 per person per day, for a minimum of 4 nights. Book a chocolate treatment at the SPA and break with us the Mega Easter Egg! Contact us, we are waiting for you with our Romagna cuisine and with our management for over 65 years. Package from 24 May to 23 June and from 24 August to 16 September. 1 child is always FREE! The Hotel Augustus is directly on the sea, in a strategic position, take advantage now!